When, during the processes that lead up to birth, does human life become a human person? Unfortunately, many pro-lifers identify all stages of development from a zygote (an ovum after fertilization) to a newborn baby as “babies.” This confuses the difference between human life and human personhood. Also, unfortunately, many pro-choicers promote a woman’s right to choose abortion until at or near the end of pregnancy when the fetus is clearly a baby, and is able to function independently outside of its mother’s womb. My understanding is that doctors define the end of personhood — death — to occur when the higher brain functions end. 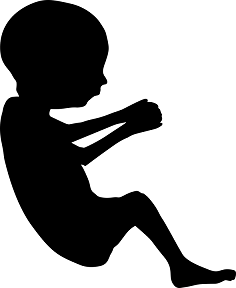 My belief is analogous to this: the beginning of personhood is achieved by the fetus when her or his higher brain functions first begin. This happens at about 24 weeks gestation. My belief is that abortions should be restricted after about 21 weeks to cases that endanger a woman’s life or seriously endangers her health. This allows for a few weeks safety factor. I am neither pro-life nor pro-choice. Thus my position is attacked by both sides." "A major conflict has been underway since before the U.S. Supreme Court handed down its Roe v. Wade ruling in 1973. There has been an enormous amount of debate over whether women should have access to abortions. But there has been little actual dialogue. Dialogue happens when two or more people come together, suspend their very natural desire to convince the other person(s) that the latter is wrong, and attempt to reach common ground. A consensus will never be found over whether, and under what conditions, a woman who is pregnant, has become informed of her alternatives and decided that she should have an abortion should be granted access. But perhaps a 60 or 70% agreement can be reached." On 2017-JAN-31, Tucker Carlson of Fox News interviewed Rep. Eric Swalwell (D-CA) on the Daily Signal. In their exchange, Swalwell was using the common avoidance technique often employed by politicians: to provide an answer to a question other than the question that was actually asked. "The politician here is using a common ploy: answer a question with a detailed answer that has no connection to the original question. Most people who are aware of the processes of gestaton believe that a zygote -- a just-fertilized ovum immediately after the process of conception has ended -- is a form of human life. That is because it is clearly alive and contains human DNA. Most people believe that a newborn human is not only a form of human life but is also a human person. THE burning question that is rarely considered, even more rarely asked [in public], and virtually never examined is when does human life become a human person? I personally believe that it happens about the 24th week of gestation when the fetal brain's higher functions first turn on and it becomes sentient and aware to some degree of its environment, I base this on the fact that human personhood ends at death when these higher brain functions permanently end, even though human life continues [for a while] in the form of living skin cells. So it makes sense to me that personhood begins when those brain functions first start up. Some say it happens when the embryo loses its gill slits and tail, and begins to look human. A lot of people believe it happens at conception. Until a consensus is reached on this fundamental question, there is no hope of settling under what conditions an abortion is an ethical choice. Unfortunately, I have never been able to detect any dialogue on this matter. "Rationalize all you want. At the end of the day, abortion is murder. Period."